Givat Gal residents argue Civil Administration workers who refuse to present orders, officer wounded in ensuing scuffle. 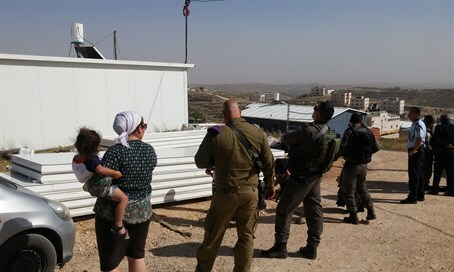 IDF Civil Administration forces accompanied by Border Police officers arrived on Sunday afternoon to Givat Gal, located adjacent to Kiryat Arba in Judea, and began seizing equipment from a home that is currently in the process of being built without a permit. "At 1:25 p.m. two people came dressed in civilian clothes to the neighborhood located east of Kiryat Arba, and began to walk around the house being built at the site," residents of the neighborhood said. "The laborers working on the house asked them who they were and what they were doing there. But they didn't answer and refused to identify themselves." Several minutes later the two started seizing work tools worth thousands of shekels without presenting any orders or other identifying documents. A clash broke out on the scene, and one of the two who turned out to be Civil Administration workers was lightly wounded. The wounded man was an officer in the District Coordination and Liaison unit. Border Police forces were dispatched to the scene, and they helped the Civil Administration workers seize the equipment. According to the version of the Civil Administration and Border Police forces, the two approached the site in an "inspection patrol," during which they saw illegal construction. They went to photograph the construction work, and then the residents began hitting the officer, according to their claims. "In light of the fact that there is a demolition order there against the concrete surface they were able to conduct enforcement activities, and therefore they seized solar panels. The tools used in the work they took quickly during the physical attack," said police sources. As noted the residents argue the forces never identified themselves or presented any orders as they took the expensive equipment. The incident comes even as the IDF is accused of largely ignoring rampant illegal Arab building in Judea and Samaria, which in many cases is funded by the EU in a blatant land grab.